New Zealand honored the victims of the far-right terrorist attack on Christchurch mosques in a commemoration ceremony on Friday. 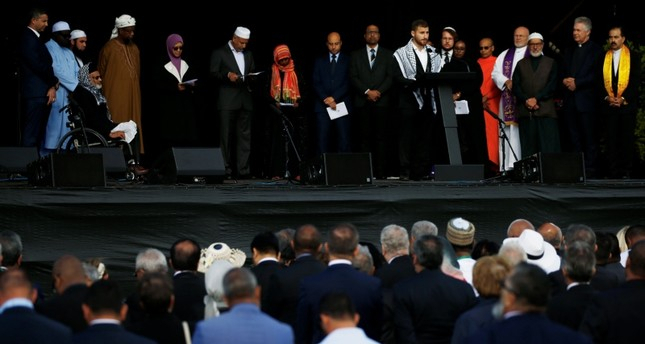 Around 25,000 New Zealanders attended the memorial service for the 50 slain Muslim worshippers, including four children, who were killed in the twin attacks on the Al Noor and Linwood mosques during Friday prayers on March 15. Among participants were New Zealand's Governor-General Patsy Reddy, Prime Minister Jacinda Ardern, Australian Prime Minister Scott Morrison, British singer-songwriter and philanthropist Yusuf Islam (Cat Stevens), and singers Marlon Williams, Hollie Smith, and Teeks. Yusuf Islam, Marlon Williams, and Hollie Smith performed at the service, Ko tātou, tātou - We are one, at Christchurch's Hagley Park. "We learn about things through their opposites," Islam said. "And it's through opposites like this, the evilness of that act and what drove it, we find its opposite, which is the love and kindness and unity that has sprung up right here in New Zealand." "Our hearts go out to the families of those whose lives were snatched away in that evil carnage while they were worshipping at the mosque two weeks ago," he said before playing "Peace Train" and "Don't be Shy." "The world has been stuck in a vicious cycle of extremism breeding extremism and it must end," Ardern, who wore an indigenous Maori cloak known as a kakahu, told the gathering. "But for now we will remember the tears of our nation and the new resolve we have formed," she said. "What words adequately express the pain and suffering of 50 men, women and children lost, and so many injured? What words capture the anguish of our Muslim community being the target of hatred and violence? What words express the grief of a city that has already known so much pain?" Ardern asked. "I thought there were none. And then I came here and was met with this simple greeting. As-salaam Alaikum. Peace be upon you." Mohamed Mohideen, the President of the Islamic Council of Victoria in Australia, said Ardern's response helped provide comfort and thanked her for her support of the Muslim community. Farid Ahmed, one of the survivors, also addressed the crowd. Ahmed, whose wife Husna was killed in the attacks, said he had forgiven the attacker. "I want a heart that will be full of love and care and full of mercy and will forgive lavishly. This heart doesn't want any more lives to be lost. This heart doesn't like that the pain I have gone through ... that any human being should go through that kind of pain." "Their body is going to perish but their souls are not going to perish," Ahmed said. "I'm very positive about this continuing," said Manan Bohra, who runs a Muslim community center in Auckland. "When we're walking down the street people are coming up and expressing their peace and love. "It was a very tragic event, but it's been a life-changing event for the nation itself." Christchurch mayor Lianne Dalziel said the atrocity was "an attack on us all". "Those actions were designed to divide us and tear us apart," she said. "They have instead united us." Names of the victims who died in the attacks were read out at the service. The youngest of the victims was only three years old. The latest memorial service was a more formal occasion, with Morrison and foreign dignitaries from some 60 nations attending. Morrison later told reporters the service "was a thing of absolute beauty." Australian prime minister said he has been working closely with Ardern to look at issues such as gun laws and blocking extremist content on social media. "There are the laws we need now, to ensure that social media is not weaponized," Morrison said. New Zealand's police force put on a show of force, closing down nearby streets and patrolling the park with semi-automatic weapons. Police Commissioner Mike Bush confirmed armed police from Australia were on site to assist their New Zealand counterparts. But the atmosphere was relaxed during the 90-minute commemoration held on a sunny morning in Hagley Park. "Let's keep leading the way," he said. "Let's keep being that light in stormy waters for the rest of the world to see how it's done."